SACODEYL has developed software that perform different roles in the context of corpus-based language learning and teaching. However, our aim is to offer these applications to the linguistic and FLT community for both testing and further develpoment. 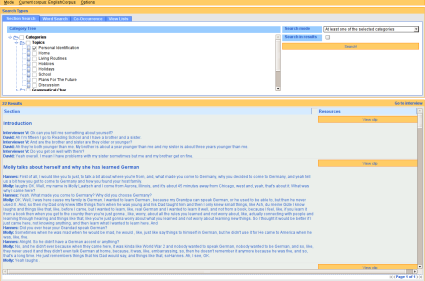 SACODEYL Transcriptor offers the user the possibility of making the transcription process of texts from multimedia sources. Import transcriptions from other formats, such as Transana format. Support transcription of spoken language: cuts, comments, trunc words, foreign words, etc. The output of SACODEYL Transcriptor is used by SACODEYL Annotator. SACODEYL Annotator complies with the TEI guidelines. The Search Tool offers language learners and teachers to systematically search the SACODEYL corpora according to various criteria. It also provides a possibility to browse the corpora. 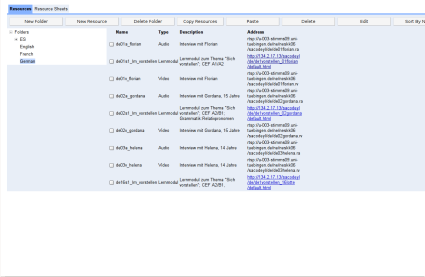 The Search Tool can be loaded directly with corpora created using SACODEYL Annotator. We will make both the source code and the web application archive (WAR) available under the GNU General Public license. However, while these packages are not ready, you are welcome to try out the Search Tool using the link below. The Virtual Resource Pool offers a way of centralising information about pedagogical resources. Resources can be grouped into resource sheets which can then be linked to from other applications, like SACODEYL Annotator or the Search Tool, but also other non-SACODEYL applications. The VRP can be used directly from SACODEYL Annotator during the annotation process if one wants to link resource sheets to one's corpus. We will make both the source code and the web application archive (WAR) available under the GNU General Public license.